For two decades, the ethereal Wayne Gretzky lifted hockey to new and dizzying heights while establishing himself as the greatest player of all time. He transcended hockey and was the most statistically dominant player in the history of North American team sports. Gretzky helped win four Stanley Cup Championships and three Canada Cup tournament titles during his illustrious career. He became the NHL's all-time leading goal, assist and point producer for both regular season and playoffs. Gretzky won 10 Art Ross Trophies as the NHL's leading scorer, nine Hart Trophies as the League's MVP and two Conn Smythe Trophies as playoff MVP. He earned five Lady Byng Trophies as the NHL's most gentlemanly player and made 18 consecutive All-Star Game appearances, securing three All-Star MVP Awards. Gretzky is an eight-time First All-Star Team member and seven-time Second All-Star Team member. He holds virtually every offensive record in the NHL and his tireless support of the game has contributed significantly to the popularity it enjoys today. As a six-year-old, the Brantford, Ontario native was good enough to play on a 10-and-under team. Four years later, a 10-year-old Gretzky finished the 1971-72 season with 378 goals and 120 assists in the Brantford atom league. Such was the advanced billing as Gretzky arrived in Sault Ste. Marie, Ontario to play for the Greyhounds for his first and only full year of major junior hockey in 1977. Selected third in the annual midget draft by Sault Ste. Marie, the 16-year-old Gretzky justified the Greyhounds' faith in him, scoring six goals in his first game and proceeding to take OHA Rookie of the Year honors. After playing just eight games in the WHA, the 17-year-old Gretzky was sold to the rival Edmonton Oilers. On January 5, 1979, Gretzky realized a lifelong dream by centering a line with Gordie Howe (Gretzky's childhood idol) and son Mark Howe on the WHA All-Star Team against the touring Moscow Dynamo club from the Soviet Union. He finished the 1978-79 season with 110 points and was named the WHA's Rookie of the Year. Over the next seven seasons with the Oilers, Gretzky eclipsed even the lofty pace set in his rookie year, averaging nearly 192 points per season. In 1988, after helping Edmonton Oilers capture a fourth Stanley Cup and winning a second Conn Smythe Trophy as playoff MVP, Gretzky was traded to the Los Angeles Kings in one of the biggest deals in sports history. In 1996, Gretzky signed as a free agent with the New York Rangers, joining his former Oilers teammate Mark Messier. "No. 99" was formally retired at the 2000 NHL All-Star Game in Toronto and will never again be worn by an NHL player. In 2005, he was named Head Coach of the Phoenix Coyotes. 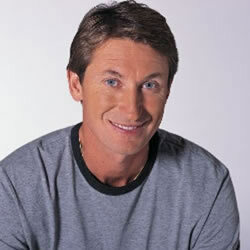 In 2002, Gretzky served as the Executive Director of Team Canada's Olympic Hockey Team. He was responsible for assembling Canada's best ice hockey players at the 2002 Olympic Winter Games in Salt Lake City and, under Gretzky's leadership, Team Canada persevered to win the Gold Medal for the first time in fifty years. Gretzky also gives his time to countless charitable endeavors. He serves as Honorary Chairman of Ronald McDonald Children's Charities in Canada, and is an Athlete Ambassador and Honorary Member of the Board of Trustees of Right to Play. Gretzky also is a participant in "Hands That Shape Humanity", a project for the Desmond Tutu Peace Centre.